If you’ve not already seen the study by Yongheng Deng, Joseph Gyourko, and Jing Wuu that appeared at voxeu the other day and you still think there’s not a problem with real estate prices in China, you might want to go read that paper. The one chart that stood out for me is below along with a conclusion that should strike fear into any recent buyer. To provide some insight into just how risky prices and price-to-rent ratios are at these levels, we calculated what would happen if people began to expect that their homes would grow in value by only 4% per year. 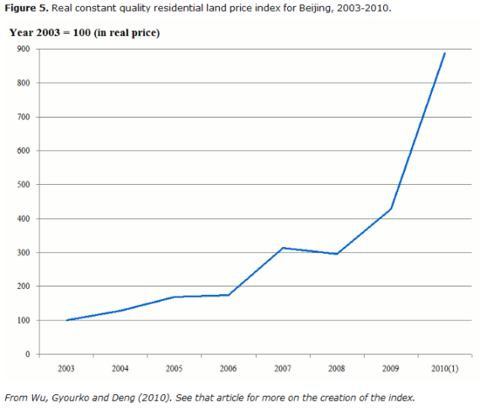 For Beijing, prices would fall by over 40%, absent offsetting rent increases or other countervailing factors. Tim Iacono is the founder of Iacono Research which provides market commentary and investment advisory services specializing in macroeconomic analysis and commodity based investing. He also writes the popular blog The Mess That Greenspan Made.